Getting seen and being clicked. Isn’t that what sending an email is all about? 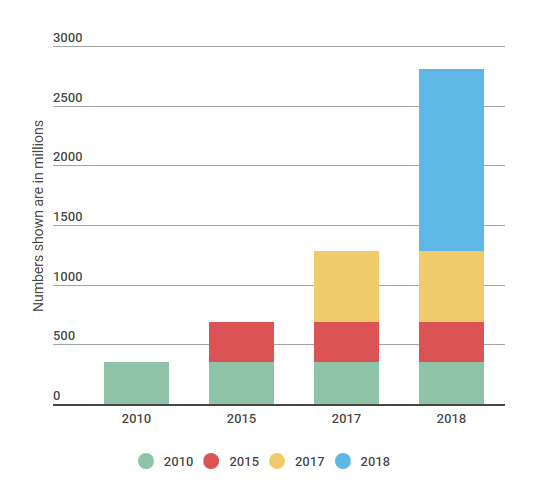 But email campaigning continues to grow exponentially, and more people are studying ways to ensure their email is the one that gets clicked. That’s one reason timing has become an increasingly hot topic over the last 10 years. One way I know this has become a “thing” is by watching my inbox. But another tell-tale sign is Google search results. I queried “best time to send email ‘2010’” and got about 300 million results. Same phrase for 2017 brought up over a billion results. And 2018 (which isn’t over yet, and which I’m adding another result to right now) came to a bloated, nearly 2 billion suggestions. So who are the top 10 voices of today’s billions of authors on articles on when to send your email? 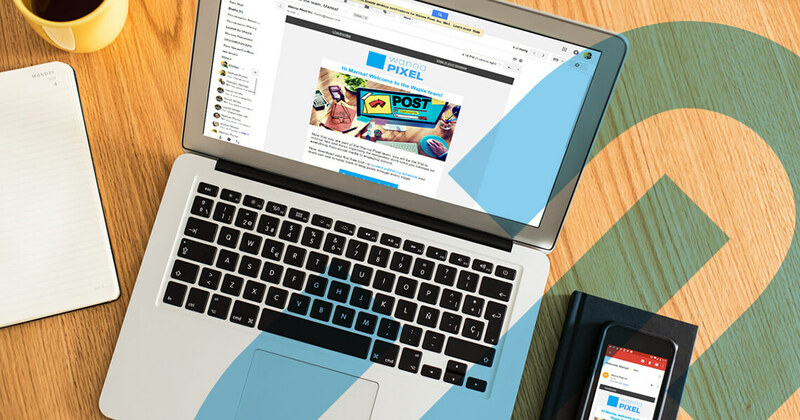 What does their research say about getting your email seen and clicked? What should you do about it, starting today? And how much does timing REALLY matter? Let’s be clear. I chose the top 10 (non-ad) Google search results for 2018 for this. After all, if they’re smart enough to score at the top of the search engine, so maybe they know something about being seen and heard! Sleeknote reports that weekends are the worst. If you want to win, try Tuesday or Thursday morning 10:00 to 11:00 AM. Mailbird suggests you’re doing well to send on a weekday during work hours, but maybe not so great to send over lunch hour. OptinMonster hesitates to give an answer, citing research that shows varying results for week days versus weekends as well as times of the day. SEOPresser gives an overview of the research, just as these others, but they’ve also spent time studying their own results. Their decision? Mondays are generally considered to be the worst day you can send your marketing emails or newsletters. InfusionSoft has also done some sleuthing. Their theory is that most businesses tackle the most difficult tasks Monday to Wednesday and catch up on emails later in the week. Convince and Convert compiled their research solely as an infographic, for the benefit of those who don’t want to read all those words. But they make sure to tell you right up front: Tuesdays at 10:00 AM. Agile CRM agrees that the industry averages say 11:00 AM on a Tuesday or Wednesday is the optimal time to send an email. Sumo highlights what others touched on briefly: best times vary depending on your target audience. SalesHandy feels Mondays shouldn’t be knocked. Some companies have seen as much as a 45 percent open rate on Mondays. On the other hand, don’t forget that time zones and country cultures vary around the globe. SendInBlue team compiled the data and found that email engagement is generally best for those sent during mid-morning at 10:00 or mid-afternoon at around 2:00. Basically everyone reiterated that you have to know your audience. Some audiences’ prime time is the weekend. Some campaigns have been most successful sending at midnight or in the wee morning hours. Some have found evenings after work to be the best. Results differ based on whether you’re selling something to a business or to an individual on a personal level. Results differ based on whether you’re giving information for free or trying to use information as clickbait in order to sell something. But after those caveats, the consensus is Tuesday through Thursday at 10:00 AM or 2:00 PM, in the time zone in which the recipient lives. This is where you make a key decision for your campaign. And it’s probably going to require some work. Look up your last several (3 to 6) mailings and check when they were sent out. Make note of the subject of each email in Column One and the time it was sent in Column Two. Be happy that you’re on track and keep doing what you’ve been doing. Decide it’s time for some in-house testing of your email prime time. If you chose the second option, here’s what you want to do next. Add this to additional columns on your spreadsheet. If the send times of those campaigns varied, check out whether the stats seem to vary along with the send time. Now set up A/B Testing (here’s how in CiviCRM). Set a distinct send time for each segment. After a few days, track the statistics and see if there’s any significant difference in opens, clicks, etc. Retest as often as needed to find your sweet spot. Four: How Much Does Send Time Matter? We all know that there is no secret formula. Success is a multi-faceted jewel, cut out by a lot of hard work on many different fronts. Writing quality and compelling copy. Catching interest with an engaging subject line. Keeping your email streamlined and uncluttered. Presenting a clear call to action. Making sure the landing page is attractive, uncluttered, and focused. Keeping any donation/payment options simple and direct. Following up with a thank you. Letting donors know the impact of their gifts. Should you be using CiviCases? 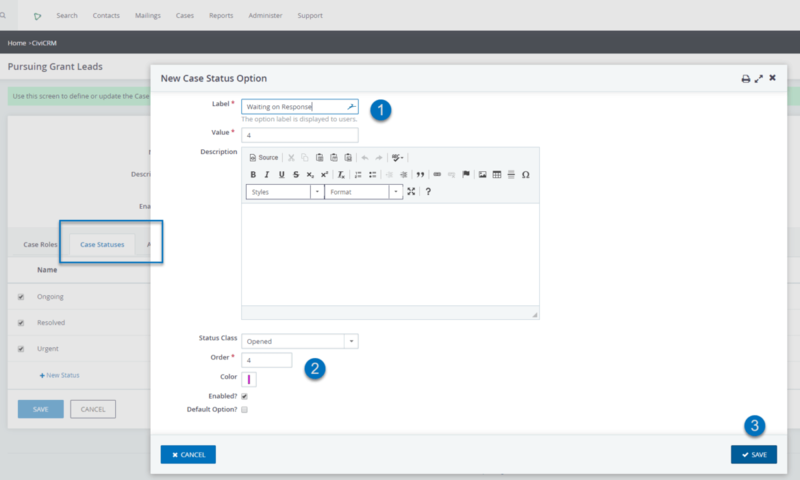 Should you be using cases for workflow management, even if your nonprofit is small? And specifically, should you, as a CiviCRM user, be making use of the CiviCase extension to follow through on typical processes in your organization? When it comes to covering your bases in new-client management or in collaborative efforts, you need structure. You need a process that will keep you on track. And you need a process that your team can follow. This is true whether you are using your CRM to manage healthcare cases, legal cases, grant funding, or even volunteer onboarding. Yes, some of these things could be tracked simply via activities logged to a contact’s record. But as soon as you have a specific workflow for a process (even if it’s a loosely defined process), we suggest you consider automating that workflow in CiviCases. What are the benefits of using case management? A case gives a cohesive view of multiple activities, often enacted by multiple team members over a period of time. Collecting all that data in one place along a specified timeline and overseen by a specified case manager results in an orderly process and an official record. A case manager can define a specific or general workflow for her team to follow using the CiviCases structure. Once that’s in place, the team not only knows what the routine is, but also is reminded of each specific task in the order it’s to be done. Because of that structure and the automated reminders based on your timeline, a manager can be assured that each case is handled appropriately without hovering. Or, if in fact the case manager handles all cases herself, she can be sure, using her automated flow, that she doesn’t let anything fall through the cracks. It’s all about processes. It might be volunteers asked to help with convention setup (if that’s something you do a lot of). Or it might be the process you follow in admitting a patient. Or procedures for reaching out to foundations for grants. We want something defined and repeatable, and that’s the kind of structure that CiviCases can give. But it’s more than just having a routine series of activities defined in a certain order. CiviCases is also a good fit for teamwork. Once a case has been opened, multiple people can be assigned roles on the case. As the case progresses, each of the team players can see updates and status as well as do their own part in moving the case forward. Finally, with CiviCases a complete collection of all communications, forms, process documents, and any other supporting documentation is filed in one place to create a cohesive record. This can be crucial as a reference point for history or for auditing. 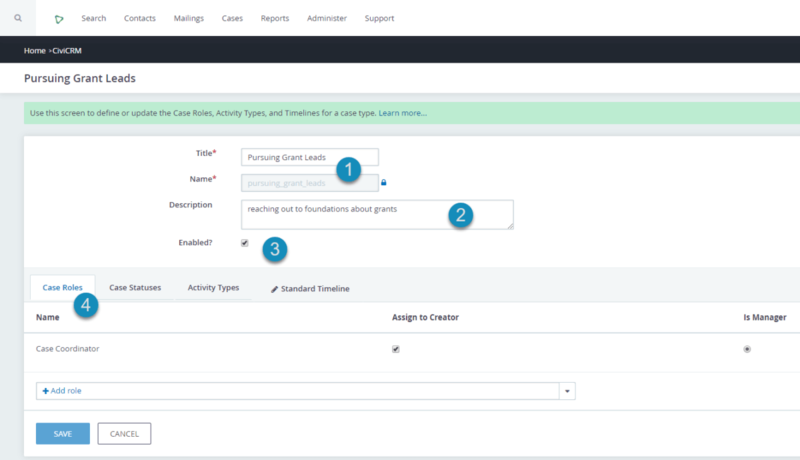 How should you get started with CiviCases? If you had a lightbulb moment as you glanced over some of the advantages we just mentioned, and you’re thinking of a good use for CiviCases but you don’t know how to get started, here’s the how-to tutorial. Or, if you prefer, let us do the backend setup, and you won’t need to worry about more than the day-to-day usage. First, make sure Cases is enabled. Though it comes as default with CiviCRM, it’s one of those components that needs to be turned on manually. Go to Administer > System Settings > Components and enable it. Now it’s time to take a look at your checklist or spreadsheet and start planning. List out the general steps you will follow. (Notice that if there are additional activities mid-process that don’t happen in every scenario, those things can be added to the case as you go. This is just for the items that tend to happen in every case.) Also, think about which of your team members will be playing a part in these cases and what “roles” they fill. Lastly, consider the statuses you’ll need to implement for each case. In Progress, Paused, Urgent, Closed, etc. One: Go to Administer > CiviCase > Case Types, and we’ll designate your first type of workflow there. There are two sample cases entered here by default. You can choose to edit one of these to make it your own, or you can click the New Case Type button and start from scratch. Give this kind of case a title, and the system auto-creates the code name. If needed, describe this case type. By default, this is enabled, but if you ever stop using this scenario, you can come back in here and uncheck that button. Two: Next we can go to the Case Statuses tab and review the default statuses. If you decide you want additional statuses, select New Status. Give it a label. And a description, if you want. Select any other criteria you think will be helpful. The Status Class is “Opened” for most activities. But if this status indicates the case is closed, set that to “Closed” here. If you want this status to be the automatic label for these cases, be sure to checkmark that box. Three: You’ll want to set up the types of activities you usually perform for this kind of case. You can delete any that you’re sure you won’t be using. And if there are activities you want to include that aren’t listed here, add some more. Four: And, finally, you’re ready to set up your typical timeline. Start with the “Open Case” activity. This is always triggered when you open a fresh case. Assign a Reference. This tells the computer when the activity should be triggered. I want the first activity to be triggered when I open the case. And the next activity “Research” to be triggered once “Open Case” is complete. Determine your Offset. If you enter a number here, it tells the computer how long to wait after triggering this activity before it triggers the next one. I want to have 14 days to do research before the computer reminds me to reach out to a colleague from the foundation I’ve been researching. As a case progresses, the tasks can be arranged so that the next upcoming task is always at the top of the page, with completed tasks below, or visa versa. Set that preference here. 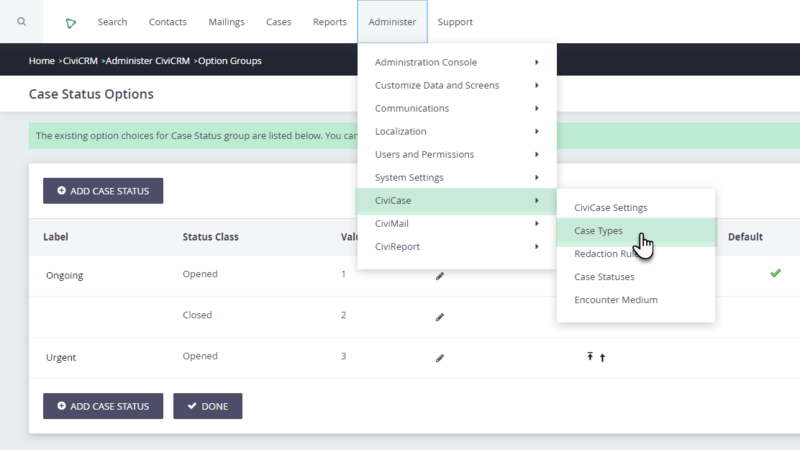 Your administrative case setup is complete, so be sure to Save! When you add a case, you’ll need to enter some information about it. As usual, required fields are starred. 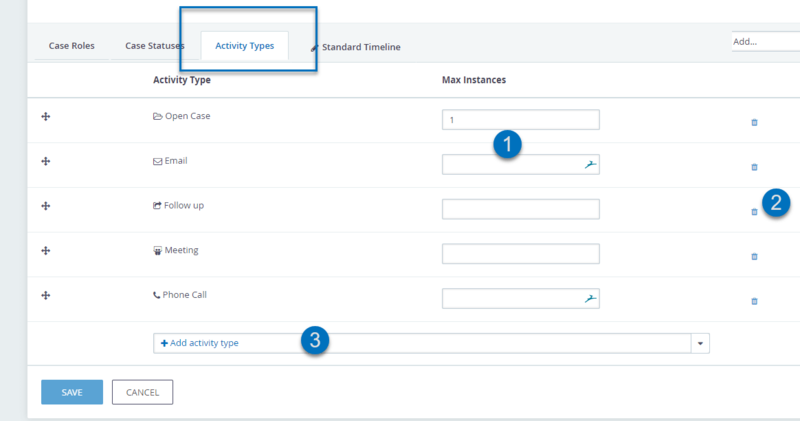 The Activity Medium is non-essential, but if a case is opened due to a specific means, that can be set here. And now that the case is saved, I will be able to manage it from my dashboard. Notice that you can toggle between your own cases and all cases. At the top, you’ll see any cases with upcoming tasks you should be attending to. And underneath are the cases you have recently completed tasks on. Manage the case, delete it, or assign it to someone else. Managing case workflow is 99 percent of CiviCases, so here’s an overview of case management. Make additions, corrections, or reports. Edit or add more people involved in the case (either someone playing a role in the progression of the case or additional subjects of the case). Here’s some of what you might see as you work on the next activity. The information at the top is mostly preset but can be adjusted here. The various dropdowns give space for categories of information you can add. The center of the screen is reserved for the basic details of the case. If the activity is still in progress and you’re just adding notes, the status should reflect that. But be sure to mark it as Complete once this activity is done. Do you use CiviCases? Let us know if you have additional helpful pointers. Or feel free to reach out if there are areas you need us to troubleshoot. You’ve worked hard to grow your clientele, donor base, and community of supporters. They trust you with their contact information and more. Investing in the long-term security and support of your CiviCRM system is critical to your organization’s success. With a Service Level Agreement with Wanna Pixel, let us worry about the technical details so you can focus on what matters most: building relationships to grow your organization’s impact. Your biggest IT support costs come from downtime, according to the “True Cost of IT Support” by Imagine IT. And that’s not just when your site is inaccessible for five hours. Downtime includes any lost staff time. For instance, if your site takes an extra five seconds to load each time staff clicks “Save” or “Next,” and you have three staff members clicking 250 times a day . . . that’s over an hour of frustrating downtime every single day. That’s why we take site performance seriously. If we see that page loading is significantly slow, CPU is maxing out at certain times of day, or storage space is more than 75 percent used, we’re going to be proactive about that. We closely monitor uptime, and even a small bleep triggers a notification so that we can take immediate action if necessary. We offer our SLA clients VPS (Virtual Private Server) hosting, so that you’re not sharing a slice of the same cheap pie everyone else gets. VPS hosting allows us to configure your environment based on your needs, so that performance and stability are never compromised. A majority of our CiviCRM clients opt for our Performance VPS package (4GB RAM, 2 Cores, 48GB SSD) paired with a content delivery network (CDN). The CDN is a term many of our clients aren’t familiar with, so to put it simply, it’s a system that makes use of multiple geographically distributed servers working together to provide consistent, high-speed delivery of your internet content anywhere in the world. In our monthly reporting, we let you know what your site’s performance has been like, and if we have recommendations for even better performance measures, we get in touch with you. Our clients value their SLAs because they know we have their backs if anything goes wrong. While we keep their website tuned, they are freed up to focus on social good efforts, which is a full-time job already. And knowing that we’re only a phone call away assures them of the help they need if an emergency were to occur. What is one of the most dreaded headaches of any nonprofit that keeps a database full of people’s personal data? A website that’s been compromised by hackers, assaulted by spam-bots, and otherwise damaged by internet thugs. Cyber attacks are rampant, and we take that seriously, using only the best and most up-to-date website firewalls to protect you. All of our clients to date are using either the Drupal (predominantly) or WordPress CMS, and both systems take security seriously. While Drupal is touted as a security-focused system and has managed to successfully keep vulnerabilities at bay, WordPress does well too. In fact, due to the higher usage of the WordPress platform, cyber-attacks are more often focused on their system, which keeps WordPress on its toes and up to date. Another important aspect of security is daily backups of your site. Accidents happen. Remember the good old days before auto-save? Unfortunately, I was one of those that got bit. I remember being in my 20s (yeah, way back when) and writing up a long, thoughtful article on a topic I felt passionately about. Too passionate, it turned out, because I didn’t pause and save. The whole thing was irrevocably lost in cyberspace. We’re here to make sure your passion is preserved. Regular backups can make all the difference. In a perfect world, we could skip this section. But as we all know, we live in a fallen world, and sometimes, despite our best efforts, catastrophes happen. That’s why we offer emergency support as part of our SLA package. We will quickly set to work recovering your technology environment from backups and even move to another technology environment if necessary. What’s more, we’re not going to make you wait on hold for 45 minutes, only to talk to someone who knows nothing about your system’s setup. When it’s time to pinch-hit, we’re not going to farm you out to some foreign IT support. When our clients sign on with us, we make sure they have clear instructions on how to get in touch with us and receive timely help. You, as the client, give us the names and emails of key personnel, so that our system immediately recognizes and prioritizes their requests. In case of an emergency, we always ask that you send a short, descriptive email to the address we have provided, followed by a phone call to our support desk. This way, we are on the alert and proactively addressing your issues by the time you pick up the phone. Sometimes you have questions that have nothing to do with downtime or emergencies. You need some advice about your recurring donations, memberships setup, or permissions configuration. Our help desk staff are glad to field your questions, give you helpful pointers, or provide you with an understanding of advanced options or upgrades. Again, we don’t outsource you. 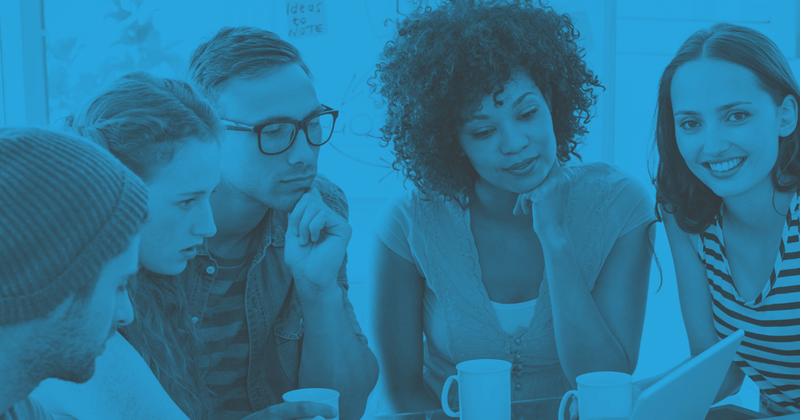 Our staff knows nonprofits, databases, CMS platforms, and especially CiviCRM. Most of our clients find that three “incidents” a month covers their typical needs. An incident is any question / help request outside of emergency support that requires 30 minutes or less of help-desk time. This feature is probably the one our clients love most. Why? A lot of the other stuff is important, but it takes place in the background. Support for your day-to-day processes is where service stands out. So remember, we’re here rooting for you! Our goal is nonprofit advancement. There are times when your organization is onboarding an employee, and you want to make sure they get trained properly on data entry. Or perhaps you’ve just added the Cases extension to CiviCRM and need a couple of basic how-tos to get you up and running. Sometimes we can offer a brief visual walkthrough or some step-by-step docs as one of your monthly “incidents.” Other times, more in-depth training is needed. In such cases, we’ll work with you to set up a quote for extensive documentation or training. If needed, we’ll even come on site and do a series of trainings. Processes make or break your database. And many of our clients have found there’s a learning curve to CiviCRM and other contact management platforms. You have to feed data into the machine in just the right way, or your reports could get scrambled, memberships lost, and contributions logged in the wrong account. Training for new staff or new software packs a big payoff. Okay, so I said there were five reasons. Here’s a bonus. We do website design and development for a broader base than just our SLA clientele. But for those who maintain an SLA with us, we offer discounted rates. For one thing, it’s our way of giving back. You’ve invested in us, and we want to honor that. Also, it just makes sense. You’ve given us the opportunity to learn about your unique needs as an organization by coming to us when you have questions. You’ve allowed us to host your site and maintain it. This makes a difference for us and for you. We have spent days trying to get permissioned access to a remote server so that we can safely update a site that we don’t host. When we host the site, the same work can be done in a matter of a few hours. These kinds of scenarios can cause frustration to all involved on the one hand, or make it a cleaner process on the other. There is not one long-term support solution to fit everyone. We’ll work with you to identify your primary needs and draw up an SLA contract that you feel is right for you. Once we’ve established your needs, you can be sure we’ve got your back. Our team of system engineers, developers, online marketers, SEO experts, designers, and support staff will handle anything you throw at us. That means you can focus on running your business. If you’re interested in chatting with one of our account managers about what’s worked for others and what could work for you, feel free to reach out to us. And now, whatever you do, wherever you are, be secure, be timely, be strong. So you’ve got that perfect donation page, you’ve grouped your nonprofit’s audience into three neat segments, and you’re announcing your latest fundraising campaign via your social media channels. But do you have the perfect automated email marketing system to keep in touch with your new donors and reach out to prospective contributors? Here’s what you need to know about CiviCRM to help you ace the email marketing campaign you’re dreaming of. CiviMail grants you a lot of versatility, because you can send an email to any individual or organization via their contact record, choose specific contacts from a report you’ve run, or send out mass mailings to your total contact base or select groups. And here’s where you start to feel the power, because segmented groups can be created as “smart” groups that periodically update themselves based on criteria you set (such as “any contact that has given X dollars in the last month”). One of the key advantages of CiviMail is that it’s built for CiviCRM. That means that basically all the fields you use in Civi, including custom fields you’ve created, are available as mail-merge token inserts. Even a large mass mailing will be automatically individually personalized, based on the data you use. No other mass mailing program out there (that I know of) integrates hand-in-glove with Civi, so it just makes sense to use CiviMail for CiviCRM. Scheduling your mass mailings is easy with CiviMail, though you may choose to send immediately as well. Just select a date and time for sending. But keep in mind that mailings sent to large numbers of recipients are sent in batches of about 400 to reduce the likelihood of the emails being caught in spam filters. Depending on how massive your mailing is, you might need to plan several extra hours for this, or choose an overnight mailing. Scheduling reminders is a thing as well. For those contacts who opted to attend an event or whose membership is running out, this comes in handy. You certainly don’t want to run a search every week just to email everyone whose membership is about to expire or everyone who just gave a contribution. 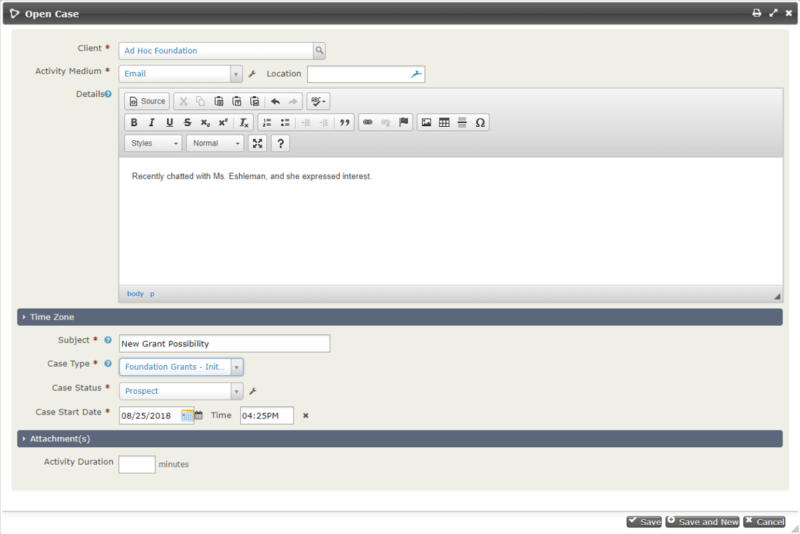 Automated responses are also customizable in CiviMail. You can decide where/to whom replies to your mailing will be sent. An autoresponder can be set up if you want to send a specific, quick response to anyone who replies. And of course responses to Opt-out, Unsubscribe, and Resubscribe can be triggered appropriately as well. Since Gena just wrote an excellent article on How to Improve Your Ask with A/B Testing, I’m not going to say much. But I will mention that CiviMail’s tracking tab is very useful in monitoring the response rate on such tests. Using this feature, you can track which links have been clicked and which emails were even opened. 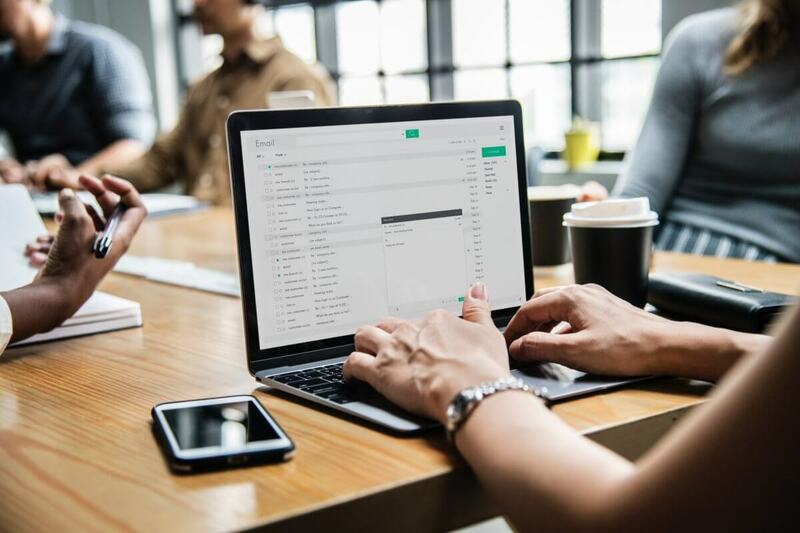 By navigating to Mailings > Scheduled and Sent Mailings, you can view a delivery summary that includes the number and percentage of successful deliveries, the number of opens, link clicks, forwards, replies, bounces, and unsubscribe requests. And any of these items can be drilled into for more detailed information. We’ve just summarized the power of CiviMail and the importance of its working hand-in-glove with your Civi database. But I have to tell you that there’s a lot of the formatting preparation that was tedious. Which is why Marisa got so excited when the CiviMail extension Mosaico came out last year. Mosaico offers what I call “Lego technology” in that it gives you all the right pieces, and you just drag them where you want them to make something that looks like the picture on the box or something totally You. It’s intuitive and allows you to be just as creative (or not) as you wish. What I really like about it is that it’s fully integrated with and native to CiviCRM. You don’t lose any of the great features, like tokens, we listed above. 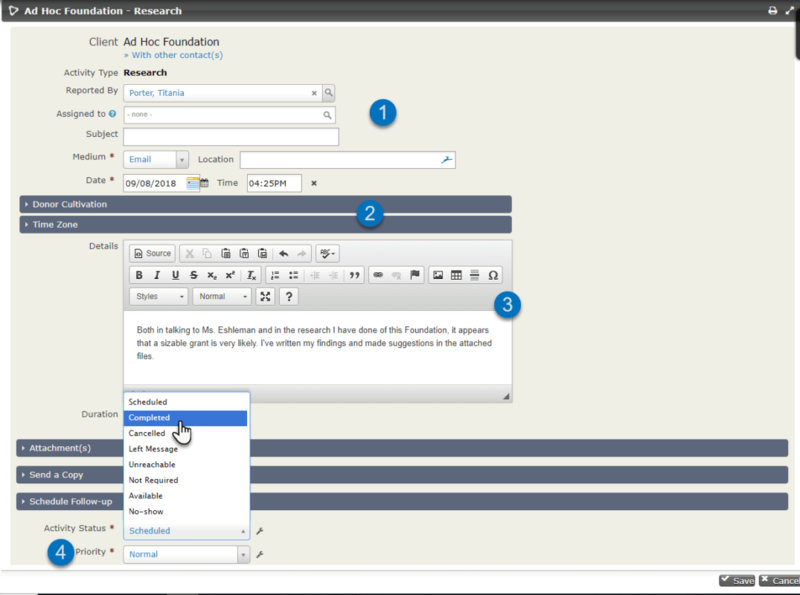 You actually build the body of your email there in Mosaico and then insert it when you create your new mass mailing. We spend our days implementing, supporting, hosting, customizing, and training CiviCRM. So feel free to reach out about your needs. Also, I’ve included a list of other helpful articles below. Is Google AdWords Killing Your Online Engagement? 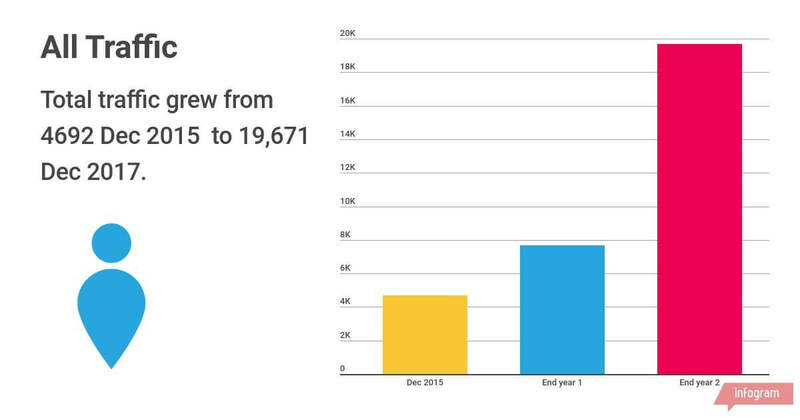 In one year, Wanna Pixel helped a client grow traffic by 2,000 percent. 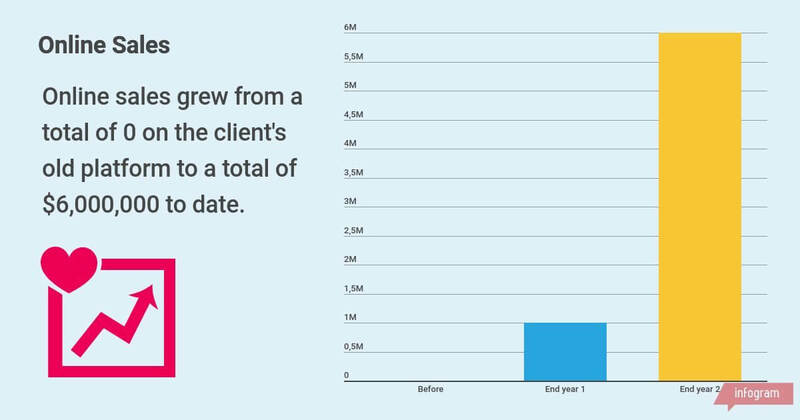 And we took the client’s online sales from $0 to $6 million in two years. How did we do this? Not by throwing money at Google Ads. And not by scattering magic keywords throughout the website (that idea became outdated at least 15 years ago). This infographic gives you some statistics as to how our client benefited from a focused content marketing campaign. What is a content marketing campaign? It’s a strategic plan using relevant information to form a connection between the value you offer and the value your audience is looking for. 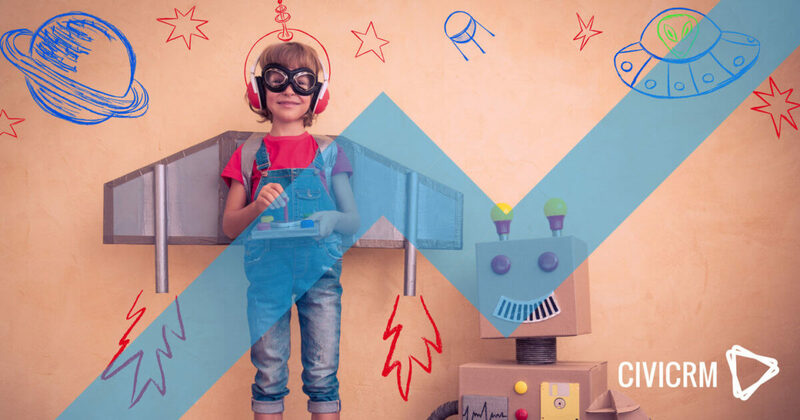 Stellar content marketing establishes trust. It’s built from the expertise you and the partners you work with have in your industry. But developing truly valuable content is either expensive or time-consuming, right? Why spend a lot of money or time on content marketing when you can throw a smaller amount at advertising instead? A dollar’s a dollar, right? It’s a fair question. After all, people might argue that ads are targeted at your audience, that you don’t have to pay for them unless someone clicks, and that ads take less time to write than a quality article. Let’s take a look at how content-based marketing actually improves your returns, compared to spending the same money on advertising. First, content written specifically for your organization is organically targeted toward your audience. What does this mean? 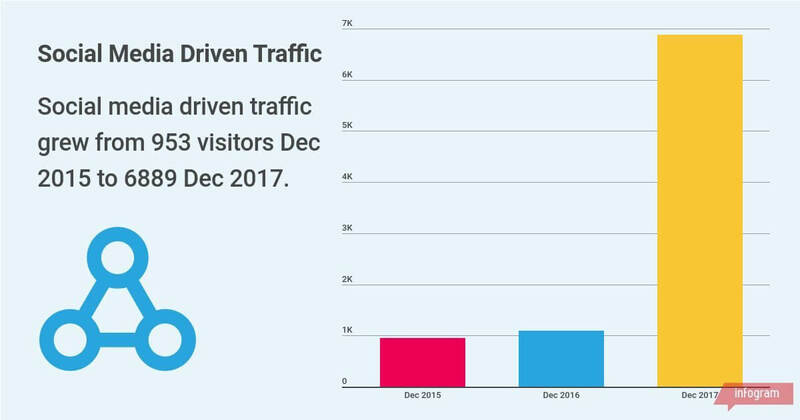 Organic traffic is when someone searches for a specific term via a search engine and websites that score high for keywords in that term rank near the top of the search results. Usually, there are a few ads above those top-ranking website results, so you might think the ads are a better option. But there’s an inherent trust established when your website shows up at the top of a page without you having bought that position from the search engine. 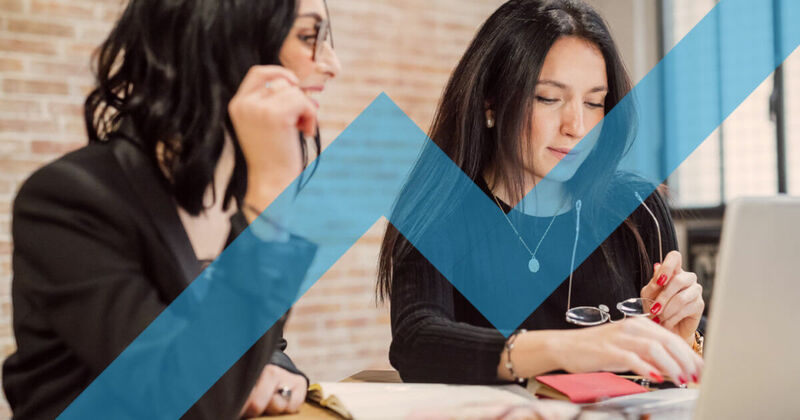 Trust is important in any sector of the internet, but when it comes to people choosing which nonprofit organizations they want to invest in, trust is even more critical to your cause. Second, cost per click ends up being more expensive over the long haul. Third, though an article takes more time to write than an ad, the investment is well worth it. Here’s a summary of our 3 content-marketing packages. The client mentioned at the beginning of this article has been using our Gold Package for the last two years and, as mentioned above, saw an amazing 2,000 percent growth in his website traffic as well as a huge return on his investment in direct leads resulting in $6 million in sales. What does all this have to do with nonprofit donations? Everything. 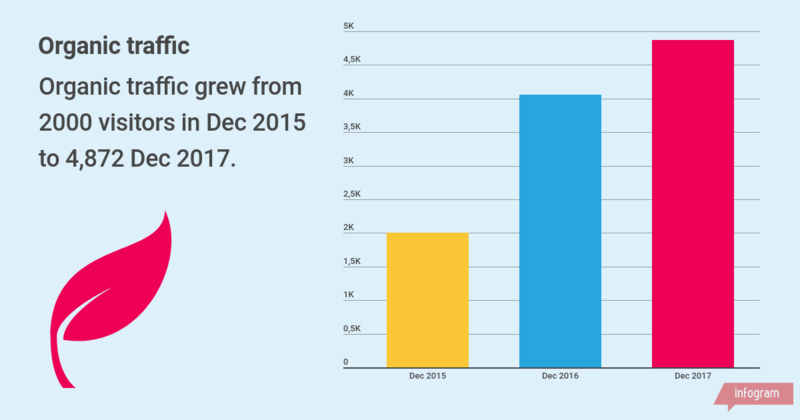 We believe nonprofits would see similar results (in growth curve if not in numbers) by revamping their SEO strategy in a similar way. Don’t buy your audience. Build it. Check out our content marketing offerings.